Vision of the Institute To become the most preferred institution providing innovative, research and value based, professional education for the society at large. 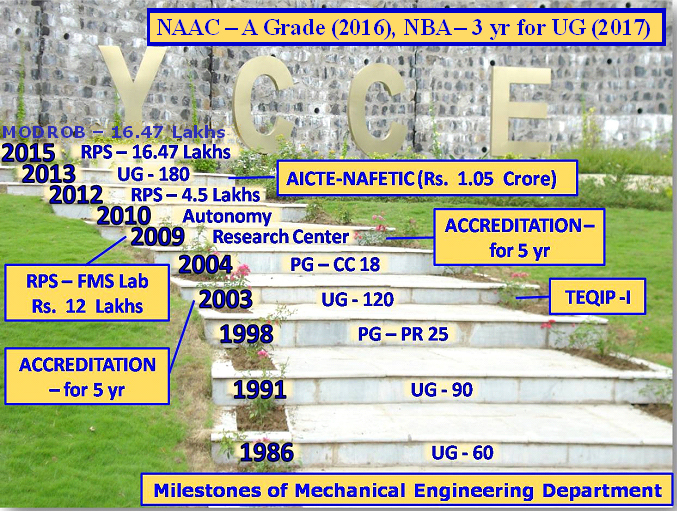 Vision of the Department "To become an attractive destination for pursuing mechanical engineering with emphasis on innovation, research and value based education." Mission of the Department "To evolve mechanical engineering professionals through creative teaching, project based learning and research in a stimulating environment." PO1:-	An ability to apply knowledge of mathematics, science and engineering. PO2:-	An ability to design and conduct experiments, as well as to analyze and interpret data. PO3:-	An ability to design a system, component, or process to meet desired needs within realistic constraints such as economic, environmental, social, political, ethical, health and safety, manufacturability, and sustainability. PO4:-	Knowledge of contemporary issues. PO5:-	An ability to use the techniques, skills, and modern engineering tools necessary for engineering practice. PO6:-	An ability to identify, formulates, and solves engineering problems. PO7:-	The broad education necessary to understand the impact of engineering solutions in a global, economic, environmental and societal context. PO8:-	An understanding of professional and ethical responsibility. PO9:-	An ability to function on multidisciplinary teams. PO10:-	An ability to communicate effectively. PO11:-	An ability to demonstrate knowledge and understanding of engineering and management principles and application to the project work. PO12:-	Recognition of the need for, and an ability to engage in life-long learning. PO13:-	An ability to demonstrate knowledge, technical skill and problem solving techniques in mechanical system design & analysis. PO14:-	An ability to develop, realize and operate systems in mechanical engineering domain. In Central India, the department has introduced Engineering Graphics as a compulsory subject for the students of First year. As per the present industrial requirements of students are learning the conventional Engineering drawing using drafting software. The Departmental classrooms are designed for making teaching learning an interesting and interactive process. Our thrust areas include Product and development, Industrial Engineering and Manufacturing Sciences. To develop skills in manufacturing and fabrication, we have a well equipped Central Workshop, Siemens Centre of Excellence for digital manufacturing and robotics under NAFETIC scheme equipped with CNC MTAB FLEXMILL (3-Axis), MTAB FLEXTURN (3-Axis) Students are trained on specialized facilities like NC/CNC Machines, Robot, Flexible Manufacturing Systems and advanced software like AUTOCAD, Pro-E (Wild Fire 4), ANSYS and ROBCAD. Industrial relations further enhance our creditability, hence industry based projects is a common practice. Many faculties are on the panel of various industries for the purpose of training and consultation. The department is a recognized centre of RTMNU for doctoral research (PhD). For overall development of students department have organized events like National Level Project Exhibition (PRATIKRUTI), National conference (SPANDAN). PO-1: An ability to analyze mechanical components/systems for critical analysis and improvement in design. PO-2: An ability to apply knowledge and skills to develop solutions in the field of CAD/CAM. PO-3: An ability to handle sophisticated machines & instruments for carrying out analysis & research. PO-4: An ability to develop and execute programs for advanced manufacturing systems. PO-5: An ability to function in a multidisciplinary team for design and development of sophisticated mechanical system. PO-6: An ability to develop proficiency in communication of technical and research work. PEO-1: To understand analytical and mathematical skills for personal and professional development. PEO-2: To engross in life long, ethical learning for higher studies, research and other professional development activities. PEO-3: To understand, appreciate and develop sustainable solutions for social problems. To define the problems and provide solutions by designing and conducting experiments, interpreting and analysing data for manufacturing. To understand the impact of production engineering solutions in global, economical, environmental and societal context. To function in multidisciplinary teams. Department established Two Industry Supported Lab in Association with Minar Hydro system Pvt. Ltd. MIDC Hingna and AVEVA Technologies Mumbai. The laboratories and workshop in the department is well equipped to fulfill the need of undergraduate and postgraduate education. Departmental Faculties are having an average experience 12 Years and average age 37 Years & 16 faculty members having more than 20 years of service in the department. Faculty with academic and industrial expertise. Faculty representation on various prestigious University and professional bodies. Development activities under schemes like MODROB and RPS. The student society of the department, MATRIX is actively involved in organizing various co curricular and extracurricular activities. The department is approved as a Research Centre for Ph.D by RTMNU.